It was almost a year ago that ‘Vikings’, shot in Co. Wicklow, with approximately four hundred Irish people involved in its production, premiered on the History Channel in the USA. Now the highly anticipated series will see its first Irish screening on RTÉ2 this Sunday at 9.30 p.m.
A solid Irish team was involved behind the scenes of ‘Vikings’, including director Ciarán Donnelly (‘The Tudors’, ‘Stardust’, ‘Titanic: Blood and Steel’), Emmy award-winning Joan Bergin (‘Tudors’, ‘David Copperfield’, ‘The Prestige’) and production designer Tom Conroy (‘Tudors’, ‘West is West’, ‘Breakfast on Pluto’). The executive producer of the show, Morgan O’ Sullivan, said that he and Michael Hirst, partner, creator and writer of the show, “wanted to get in and tell the story from inside the Viking community.” He also said the fact that the series will finally be seen by Irish audiences is “most exciting” and “is probably more important to us than anything else”. Because it was picked up by the History channel, the show has been marked for its historical accuracy. O’ Sullivan commented that achieving this was quite difficult at times due to the majority of the texts based on Vikings coming from a negative Christian point of view which usually depicted the people as pillaging murderers. O’ Sullivan praised researcher Justin Pollard, who went through hundreds of books and documents as research for the show. 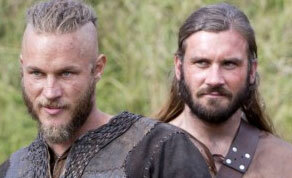 TV channel History has picked up ‘Vikings’ for a second season of ten episodes. Season 2 has completed production and will be shown on US screens this year.